They’re already calling you Dumb Joe from the corner. Edificio Itália in São Paulo. Photo via Wikimedia Commons. The Edifício Itália, on the corner of Avenida Ipiranga and Rua São Luiz in São Paulo, was the center of attention in São Paulo’s center in the late 1960s. It was the tallest building in Latin America when it was inaugurated with plenty of pomp in September, 1965. The Italian immigrant association Círcolo Itáliano had constructed the building to house its new headquarters. Swank and luxurious, Edifício Itália symbolized the progress the Italian community had made since the founding of Círcolo Itáliano in São Paulo in 1911. But in October, 1971, just down the way, the white, sleek, cylindrical Hilton Hotel was inaugurated — the first international chain hotel to open in Brazil. The pop-rock icon Roberto Carlos sang at its inauguration. And in Tom Zé’s eyes, the Edifício Itália felt threatened by this fair and modernistic newcomer. Hilton Hotel in 1972, the year this song was released. Photo via Estado de São Paulo. 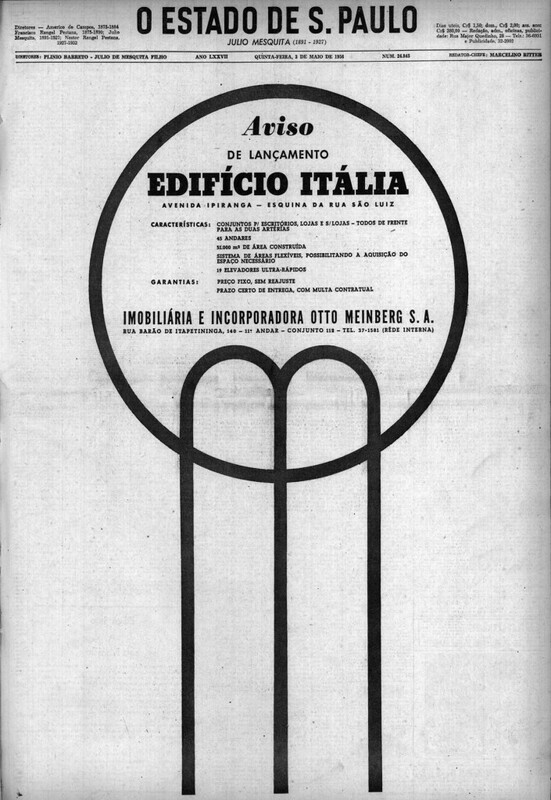 Announcement for the inauguration of Edifício Itália. The building was designed by the German-Brazilian architect Franz Heep. In this song, the two buildings, anthropomorphized, get into a petty, gossip-fueled feud. (The anthropomorphization is subtler in Portuguese since “he” and “it” are the same word, ele.) The Hilton all but admits to its affectations, but strikes back that the lavish Itália only thinks about money – with an adding machine in place of a heart. Consolação, mentioned in the song, is a central road in São Paulo; it begins near the block where the Hilton and the Edifício Itália are feuding and a bit up the road is the Consolação Cemetery, the city’s oldest burial ground. Consolação also plays a starring role in another of Zé’s songs about São Paulo, “Augusta, Angélica, e Consolação” in which the streets, like the buildings, are anthropomorphized, in this case as women displaying the traits of their namesake streets. Zé adapted quickly. In 1968, he recorded his composition “Parque Industrial,” which satirized the national fixation with industrialization (its refrain, in English, is “Made, made, made, made in Brazil”) on the album Tropicália: ou Panis et Circenses. And later that year his composition “São São Paulo,” about São Paulo residents’ conflicting feelings of repulsion and affection for the city, took first place at TV Record’s IV Festival de Música Popular Brasileira. Zé stopped collaborating with Caetano and Gil shortly thereafter, though. They went into exile from the military dictatorship in London in 1969, and Zé stayed behind in Brazil, where he says word began to spread that there was “an opening” in the tropicalist movement to fill his spot. He had a different, even less conventional style than the rest of the tropicalists, which caused friction; meanwhile, he grew jealous of their success in Brazil and abroad. By the time Gil and Caetano returned from London in 1972, Gil recalls that Zé had become a recluse and it was no longer possible for them to pick up where they’d left off in 1968. Zé continued to produce new work, but his idiosyncratic musical style and his provocative persona alienated many Brazilian listeners, particularly with the release of Todos os Olhos in 1973, and Estudando o Samba in 1976. Both albums achieved critical success only many years later, after the former Talking Head David Byrne heard the latter album, loved it, and quickly released a compilation album, The Best of Tom Zé, on his Luaka Bop label. Brazilians’ tendency to hold foreigners’ judgments in high regard – a tendency satirized in Tom Zé’s music – ended up favoring Zé’s musical career. Byrne’s accolades and the critical and popular success of The Best of Tom Zé abroad brought Zé renewed respect at home, and he reemerged from relative obscurity to play for a public more prepared for his avant garde style. The Hilton Hotel relocated to São Paulo’s Centro Empresarial Nações Unidas in 2004. The old building sat empty for a few years, until it was rented by São Paulo’s Tribunal de Justiça (Court of Justice) for office spaces in 2007.
roubando as atenções pra sua beleza. Main sources for this post: Brutality Garden by Christopher Dunn; Fabricando Tom Zé; Tom Zé official site; A Era dos Festivais by Zuza Homem de Mello.